← Why Do We Read and Write Fiction? 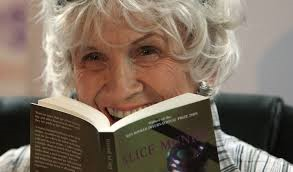 As I’m sure you know, Alice Munro won the Nobel Prize for Literature this year on the basis of a lifetime of writing plain spoken, deeply felt and viscerally moving short stories about the intricacies, snares and joys of human relationships. Advanced in years and too ill to travel, she couldn’t make it Stockholm to give the customary and expected acceptance speech, the “address” as it is called, so Nobel.org traveled to her in Canada instead and filmed a video, a revealing, unvarnished, introspective and honest interview with her about her life as a writer. It is most unlike the usual high sounding, pontifical, for-the-ages rhetoric usually served up almost compulsorily by Nobel Laureates, for it is so disarming and human, and ultimately humble and dear. I think of Faulkner‘s high sounding, inspirational exhortation to younger authors, his directive to lift up the hearts of our fellow men and women with literature, as a stark contrast to Munro’s easy-going, self-deprecating manner — as much as I revere Faulkner and his work — Faulkner and this fine lady are about as like as day and night– and yet I am surprised at how similar their messages are despite their many differences in style, locale and idiom. Here is the link, for some reason I can’t embed the video, but if you are a serious writer intent on writing something true and lasting, I encourage you to watch it, listen carefully. It’s wandering, informal, off the cuff, not at all self-important, she is elderly now and in poor health, yet its loftiness and nobility of purpose come through loud and clear. This entry was posted in Literature, writing and tagged Alice Munro, fiction, List of Nobel laureates, Literature, Munro, Nobel Prize, Nobel Prize acceptance speech, Nobel Prize for Literature, Nobel Prize in Literature, short story, William Faulkner. Bookmark the permalink. As a Canadian, I must say it has been a good year. I love … the plainness. We don’t admire roses for their complexity. I was slow to pay attention myself, Jeff, even though her stories have been appearing in the New Yorker etc. for many years. For some reason I was under the impression she wrote about women’s issues, themes, “relationships,” and I don’t go in for that kind of narrow, often smarmy, focus or “take” in fiction. She is much bigger than that, I eventually discovered, and her plain-spoken style is somehow a marvelous conduit for some incredibly nuanced stunner stories about life writ large. What a delightful and inspiring interview! I got choked up when she talked about The Little Mermaid; that had been my favorite HCA story when I was little. I too tried to imagine a different ending for the mermaid. And I haven’t yet read her work, but I plan to correct that. Her stories are very moving and subtle, due in large part (I suspect) to her ability to plumb the inner lives of her characters, their wishes-hopes-dreams, and make them spring to life for readers in their multiple dimensions and qualities, which are often conflicting and initially unrecognized by the characters themselves until the stories’ last pages or paragraphs. She is a very patient intuitive writer. I admire how she is able to do so much just by letting the characters speak and act for themselves (no preaching in Alice M., none whatsoever). People can learn a lot about human behavior and what makes other people “tick” by reading them. Many readers have said their lives and relationships have been changed, enlarged and enriched, by reading one or another of her stories. William Trevor and Peter Taylor have a similar talent within the confines of the short story form, showing (never “talking” about anything) a character’s complexities and inner struggles without judging, and eliciting tremendous compassion in the reader as a result.